Notes SUMMER WINE is an easy way to introduce wine colored foliage into your collection. . Its beautiful color, vibrancy, and arching habit brings true grace to the garden, especially in spring. In early June it blooms with white button-like flowers that contrast the leaves beautifully and rich, dark purple foliage provides stunning color throughout the season. A great landscape plant, use it as a bold accent, in groupings, or part of a mixed border. SUMMER WINE may even be cut for use in arrangements. It is fast growing and has few, if any, pest problems. This is a tough, adaptable plant is ideal for difficult sites and requires very minimal maintenance. SUMMER WINE is a vigorous plant; for best results, prune about a third of the branches to the ground in late winter. 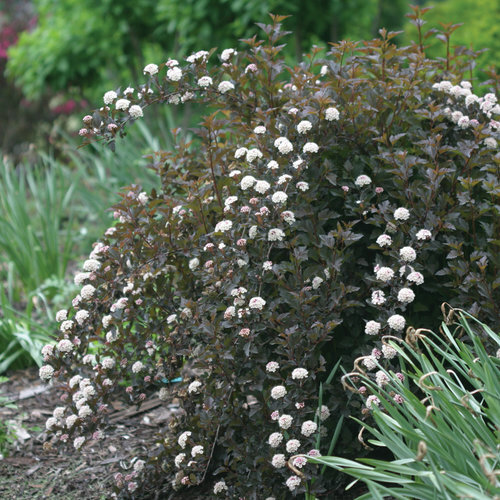 If spring has arrived in your area, purchase shrubs after the threat of frost has passed. If you buy sooner, be sure to provide protection to the tender new top growth at night. When choosing plants, don't be shy about popping the plant out of its pot to inspect the roots; the root mass should be free of black, mushy sections and amply fill the container. Remember, the more roots the better! Applying mulch around your flowering shrubs in the spring is a great idea. Not only does it look attractive, it keeps roots cool, conserves soil moisture, reduces water requirements, and acts as an effective weed barrier. Spread mulch evenly to a depth of 2 to 3 inches (if replenishing, don't allow build up to exceed 4" in depth). If your shrub is in lawn, mulch a ring between 3 to 6 feet in diameter around the trunk. Be careful to keep mulch an inch away from the shrub's trunk.Applying mulch around your flowering shrubs in the spring is a great idea. Not only does it look attractive, it keeps roots cool, conserves soil moisture, reduces water requirements, and acts as an effective weed barrier. Purchase shrubs after the threat of frost has passed. If you buy sooner, be sure to provide protection to the tender new top growth at night. When choosing plants, don't be shy about popping the plant out of its pot to inspect the roots; the root mass should be free of black, mushy sections and amply fill the container. Remember, the more roots the better! Now is a great time to plant! For SUMMER WINE, choose an open, full sun location with good air circulation. Adaptable in most soil types and withstands both acidic and alkaline soils. Apply a granular slow release fertilizer and water in well. It is recommended to apply 1 inch of water per week during the first growing season and be extra mindful during periods of heat and drought. However, in subsequent years, it can tolerate dry conditions once established. Medium moisture is best but can tolerate dry conditions once established. Applying mulch around your flowering shrubs in the spring is a great idea. Not only does it look attractive, it keeps roots cool, conserves soil moisture, reduces water requirements, and acts as an effective weed barrier. Spread mulch evenly to a depth of 2 to 3 inches (if replenishing, don't allow build up to exceed 4" in depth). If your shrub is in lawn, mulch a ring between 3 to 6 feet in diameter around the trunk. Be careful to keep mulch an inch away from the shrub's trunk. It isn't too late to add to your garden. When choosing plants, don't be shy about popping the plant out of its pot to inspect the roots; the root mass should be free of black, mushy sections and amply fill the container. Remember, the more roots the better! Early May isn't to late to make additions to your garden. However, with the increasing heat and longer days, pay extra attention to the watering needs of freshly planted shrubs. For SUMMER WINE, choose an open, full sun location with good air circulation. Adaptable in most soil types and withstands both acidic and alkaline soils. Apply a granular slow release fertilizer and water in well. It is recommended to apply 1 inch of water per week during the first growing season and be extra mindful during periods of heat and drought. However, in subsequent years, it can tolerate dry conditions once established. 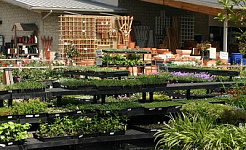 Visit your independent garden center now because fall is the best time to purchase shrubs! Here's why: In the spring, a new plant would have to divide its energy between settling into a new home and growing immediately. In the fall however, the short days are causing the top to go dormant. All the while, the warm soil, which will persist for the coming weeks or months, provides the perfect environment for roots to acclimate. Once spring arrives, the happily established plant can focus on growing and flowering. When choosing plants, don't be shy about popping the plant out of its pot to inspect the roots; the root mass should be free of black, mushy sections and amply fill the container. Remember, the more roots the better! Plant flowering shrubs now - it's a great time to get a jump on next year's garden! Choose a medium to sunny location. For SUMMER WINE, choose an open, full sun location with good air circulation. Adaptable in most soil types and withstands both acidic and alkaline soils. Save the application of a granular slow-release fertilizer for spring to avoid the initiation of tender new growth. It is recommended to apply 1 inch of water per week during the first growing season and be extra mindful during periods of heat and drought. However, in subsequent years, it can tolerate dry conditions once established. Applying a winter top-dressing of mulch will provide protection to the roots from severe winter temperatures and frost heaving. Spread mulch evenly to a depth of 2 to 3 inches (if replenishing, don't allow build up to exceed 4" in depth). If your shrub is in lawn, mulch a ring between 3 to 6 feet in diameter around the trunk. Be careful to keep mulch an inch away from the shrub's trunk. Visit your independent garden center now because fall is the best time to purchase shrubs! Here's why: In the spring, a new plant would have to divide its energy between settling into a new home and growing immediately. In the fall however, the short days are causing the top to go dormant. All the while, the warm soil, which will persist for the coming weeks or months, provides the perfect environment for roots to acclimate. Once spring arrives, the happily established plant can focus on growing and flowering. When choosing plants, don't be shy about popping the plant out of its pot to inspect the roots; the root mass should be free of black, mushy sections and amply fill the container. Remember, the more roots the better! If spring is upon you, plant as soon as the threat of frost has passed and the soil is workable. If the threat of frost persists, be sure to provide protection to tender new growth of the plant by covering at night. Now is a great time to plant! For SUMMER WINE, choose an open, full sun location with good air circulation. Adaptable in most soil types and withstands both acidic and alkaline soils. Apply a granular slow release fertilizer and water in well. It is recommended to apply 1 inch of water per week during the first growing season and be extra mindful during periods of heat and drought. However, in subsequent years, it can tolerate dry conditions once established. 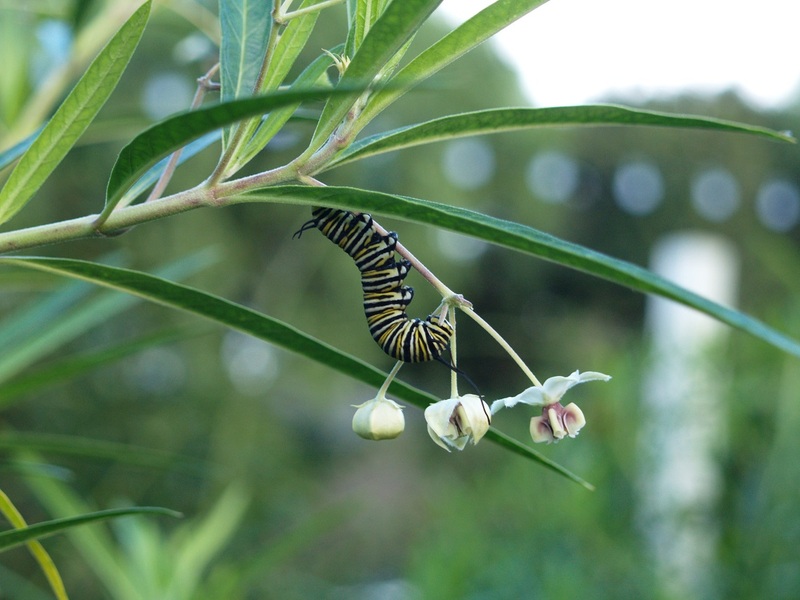 Early May isn't to late to make additions to your garden. However, with the increasing heat and longer days, pay extra attention to the watering needs of freshly planted shrubs. Plant flowering shrubs now - it's a great time to get a jump on next year's garden! Choose a medium to sunny location. For SUMMER WINE, choose an open, full sun location with good air circulation. Adaptable in most soil types and withstands both acidic and alkaline soils. Save the application of a granular slow-release fertilizer for spring to avoid the initiation of tender new growth. It is recommended to apply 1 inch of water per week during the first growing season and be extra mindful during periods of heat and drought. However, in subsequent years, it can tolerate dry conditions once established. Applying mulch around your flowering shrubs in the spring is a great idea. Not only does it look attractive, it keeps roots cool, conserves soil moisture, reduces water requirements, and acts as an effective weed barrier. Spread mulch evenly to a depth of 2 to 3 inches (if replenishing, don't allow build up to exceed 4" in depth). If your shrub is in lawn, mulch a ring between 3 to 6 feet in diameter around the trunk. Be careful to keep mulch an inch away from the shrub's trunk.Applying mulch around your flowering shrubs in the spring is a great idea. Not only does it look attractive, it keeps roots cool, conserves soil moisture, reduces water requirements, and acts as an effective weed barrier. Spread mulch evenly to a depth of 2 to 3 inches (if replenishing, don't allow build up to exceed 4" in depth). If your shrub is in lawn, mulch a ring between 3 to 6 feet in diameter around the trunk. Be careful to keep mulch an inch away from the shrub's trunk. Applying a winter top-dressing of mulch will provide protection to the roots from severe winter temperatures and frost heaving.